I didn't pause for thought, I just waded straight on into endpaper mitt number two this week. A train journey to London and carefully planned 30-minute work break on Sunday mean I have managed three pattern repeats and am now halfway through the thumb increases. 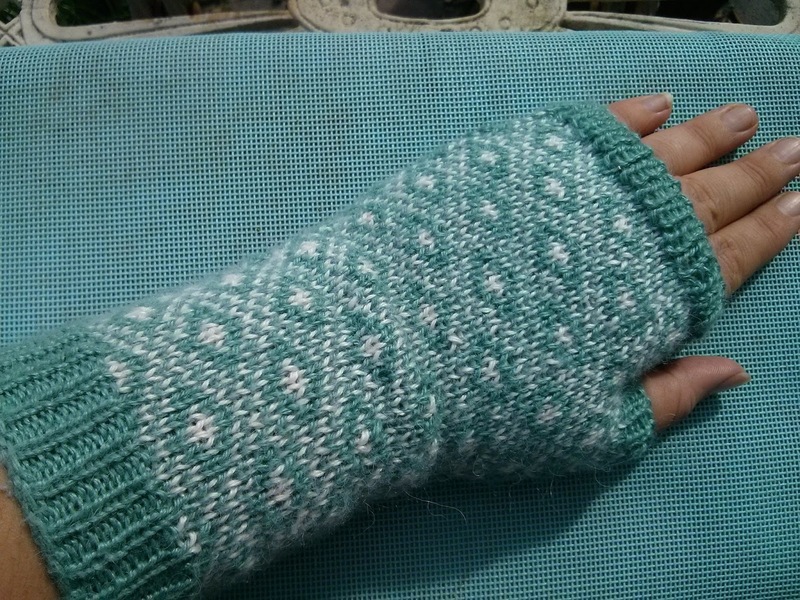 I was quite pleased that I recognised that I'd worked the bottom ribbing of mitt one as a twisted rib. 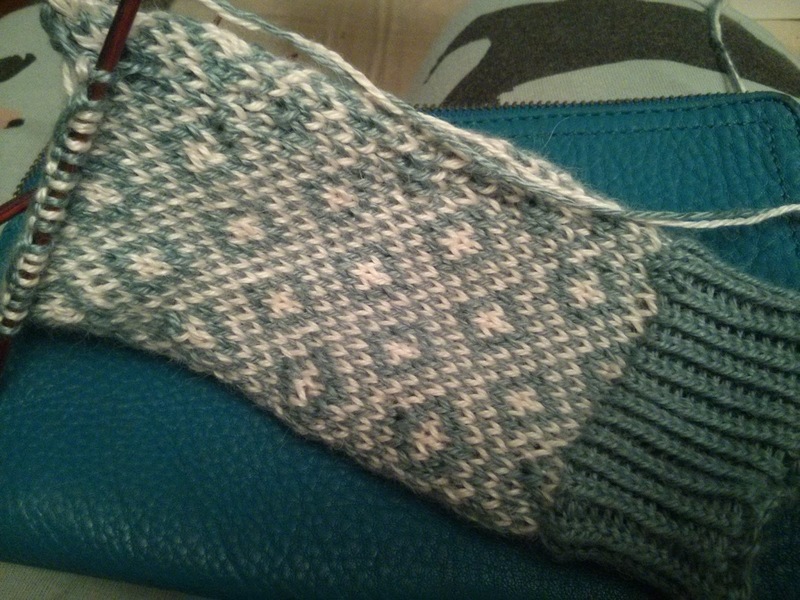 It would have been helpful if I had noted what cast on I used, since I just did my regular cast on on mitt two and it is (a) different and therefore (b) has created a longer piece of ribbing, even though it's the same number of rows. It also looks smaller, but I am hoping this is because mitt 1 blocked out exceptionally well. I soaked it and pulled it over a large shampoo bottle to dry. I expect I used the weird Italian tubular (?) cast on specified in the pattern - I was very much a pattern-follower in 2009. 2015 Sally could not be bothered to look this up, recognising that any delay might mean the second mitt never got started, and just got stuck in. Ah. Having just looked at the pattern for the name of that cast on, I see the pattern specifies 2mm DPNs for all the ribbing. This explains why my second mitt ribbing is longer, and why my first mitt top ribbing is looser than the bottom ribbing - I incorrectly assumed I was going down one needle size from the body of the mitt, not five needle sizes. Meh. They'll be under a jacket sleeve anyway, who cares? I just want them finished! It is finally all wound, into greater or lesser sized bundles. It has taken Mr Z all week to finish it, making this a two-week endeavour in total. He's feeling quite proud of itself; I am a bit daunted by how many small pieces there are. 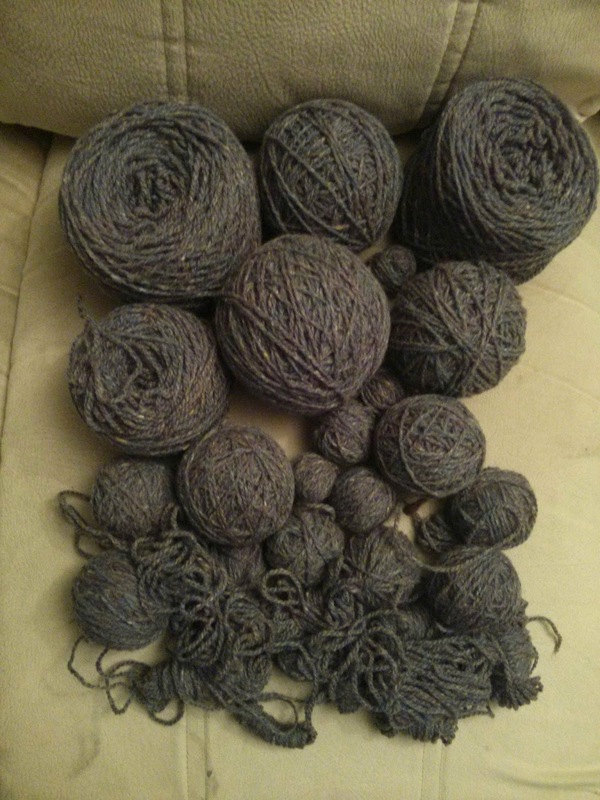 I figure, I will start knitting with the biggest cakes and balls and then if I get a sweater out of it I won't need to worry about combining and spit splicing the leftovers. They will just go in the bin. 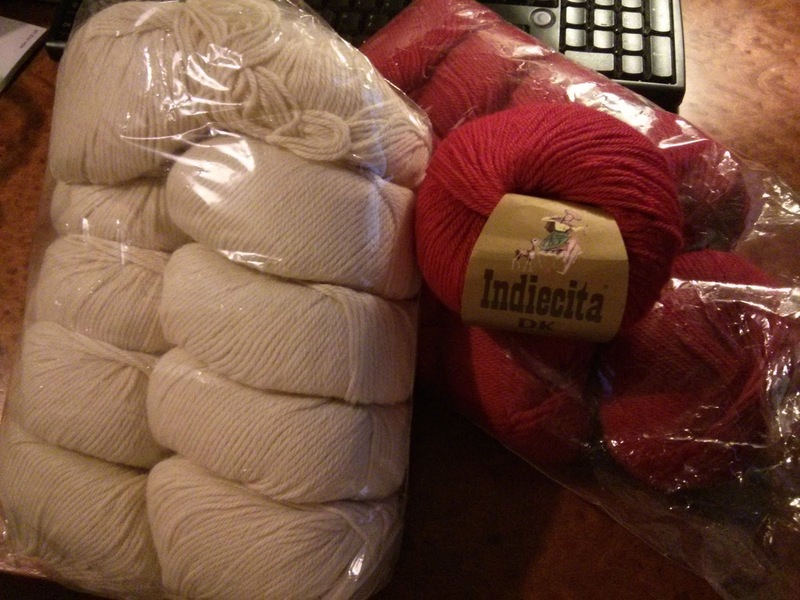 With an estimated 1500m, I think I might tackle a cabled v-neck. 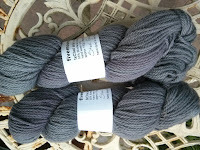 This is a really lovely, multi-tonal grey but something about it really reminds me of my school uniform jumper. A new take on that old favourite might suit this quite well. I'll add it to the neverending list. 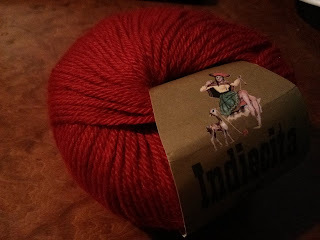 I am a bit sulky, because I really wanted to be taking a picture of my newly-cast-on Telluride Aran in the Triskelion yarn I bought at Wonderwool. However, after carefully packing all the necessaries into a little bag yesterday, ready for knit group, I then rooted out a bigger bag so I could take all my needles with me in case I got there to discover I needed a smaller one for the ribbing...and then forgot to put first bag into second bag. Hence, I was at knitting group with no sweater to cast on. Huff. Instead, I reluctantly pulled out my Endpaper Mitt. I cast these on in 2009, on my way to America, and knitted about half before putting it down and not picking it up again. In January, I pulled it out again as part of my plan to finish or frog all my delinquent FOs. I managed to work out where I had stopped, got started again and then lost interest, again. It's lucky I had no choice yesterday, really. I was knitting it yesterday and thinking, moodily, "I am never going to knit the second one". I remember picking this pattern to practice colourwork after doing the Liz Lovick workshop at UK Rav Day. 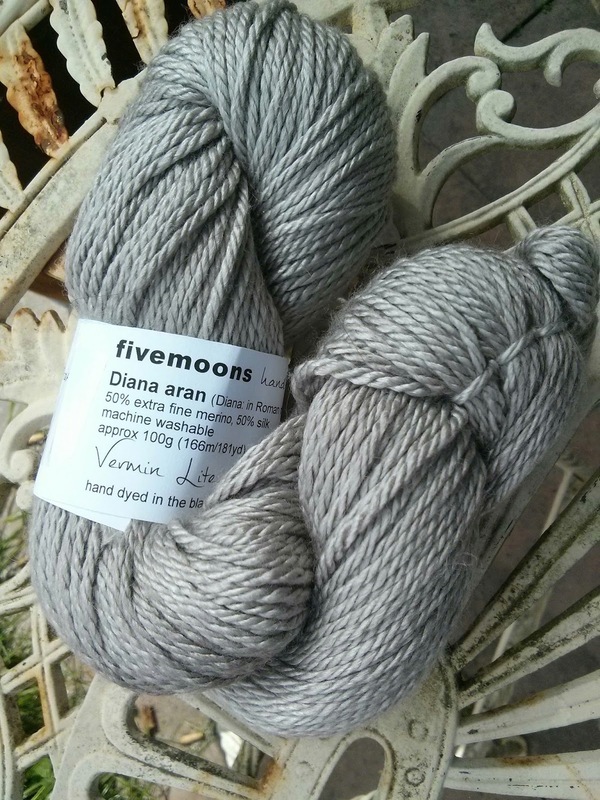 The yarn was a present from my passengers for driving. I'm working it on DPNs, which I used to love. Six-years-later-Sally would (a) magic loop and (b) not knit a handwarmer pattern written for wool in an alpaca/silk blend, or if she did, knit it at a looser gauge than specified. Luckily it does have enough stretch to be wearable. I might knit the second one. 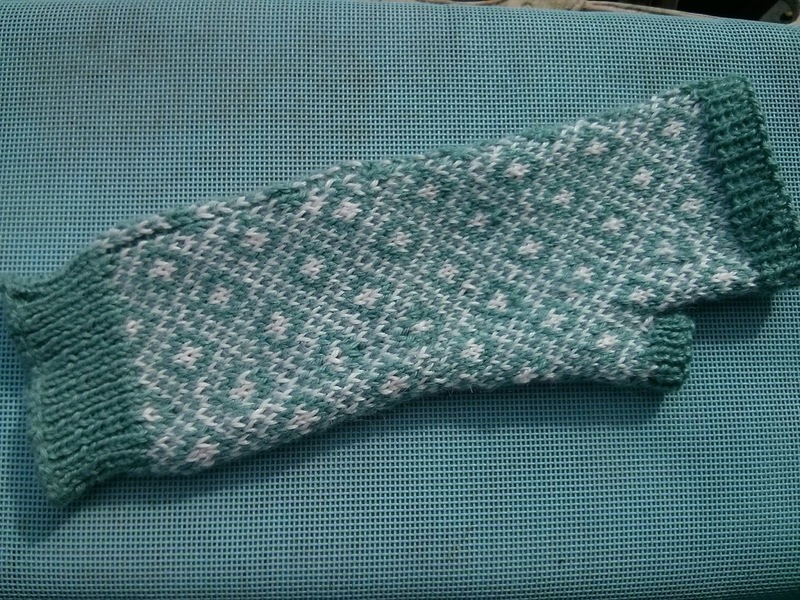 It is a lovely pattern, and only took a few hours if you add up the time actually spent knitting. That will make a grand total of one delinquent WIP frogged or finished this year. Out of 10. I'll just add the rest to my mile-long to-do list. I have a feisty, gobby girl in my year 11 class. She is fearless. I have taught her for three years now so we get on quite well. I call her Number 1 (it is an old joke going back to year 9). No1: Miss, you're like weirdly obsessed with stationery. It's worrying. Me: I think you have to be a bit obsessed with stationery to be a teacher. No1: Yeah, but you're not though. You spend too long on stationery. I bet you don't have any friends. Come on, when was the last time you left the house other than to go to work? Me: Er...well I went to a knitting show on Saturday. Me: Er. Hmm. Oohh! I went to yoga on Sunday! No1: But did you talk to anyone? Me: It's yoga! You're not allowed to talk! No1: But even if you were allowed to talk Miss, you don't have any friends so you wouldn't have had anyone to talk to. Fearless. Later, she asked where the squirrel had gone, since all the trees outside my room were cut down over the summer, along with my bird feeders. I said I hoped it was dead. No1: Miss, I'm going to train a load of squirrels and let them loose in your house. Me: Good. My cat loves killing squirrels. No1: But I'll train them! Me: But, since you've pointed out I never leave the house, I'll be able to see you coming so you won't get them in in the first place. It is quite fun to banter with someone so sharp. Not much to update on this from last week, other than I picked up 180 stitches around each armhole on a 3.25mm needle and ribbed for 8 rows to add the darker colour accent. I am more pleased with it than I expected to be - it changes the shape of the top and makes it look a bit smarter, in my opinion. And it used up some more Damask! Maybe I should put it all in swaps, it takes up so much space on its annoying cardboard tubes. It is lovely though. 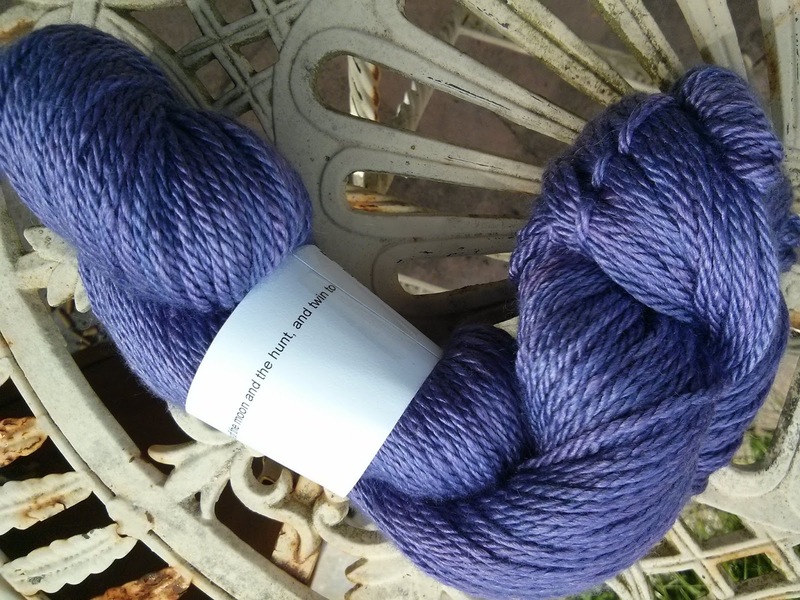 I do love a bit of linen, even in this heavy-on-the-acrylic blend. I went along to this yesterday. 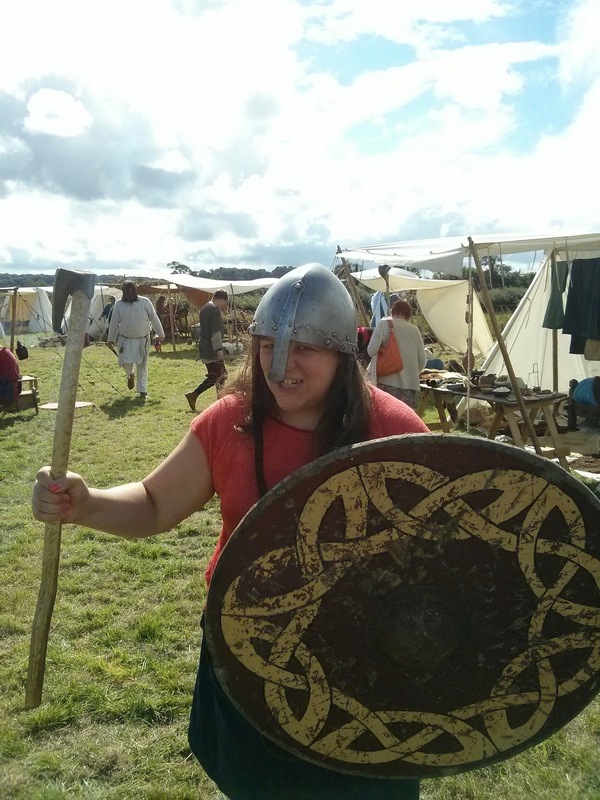 I didn't need any more yarn, but I wanted to support it because it was local and there were going to be Vikings there, which I wanted to see. Mmmm, Fivemoons! 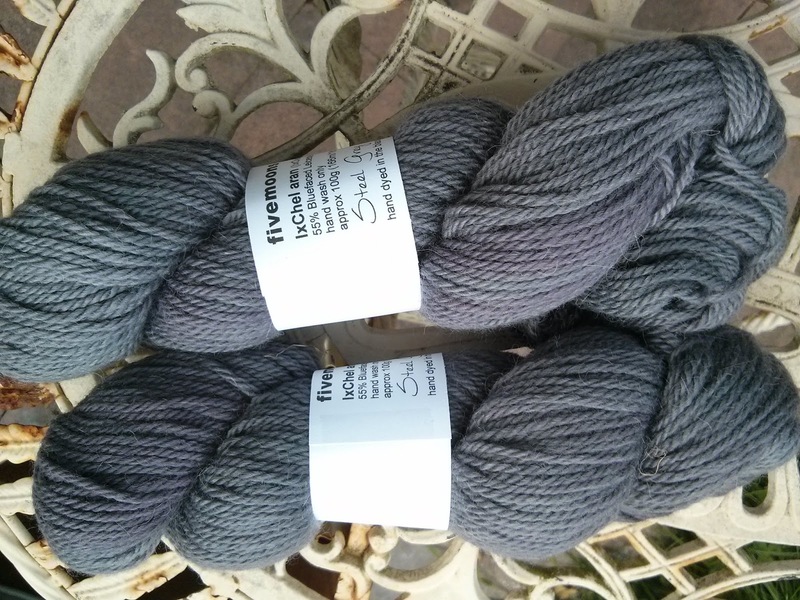 The darker grey is 100% BFL aran weight, from the sale bin. 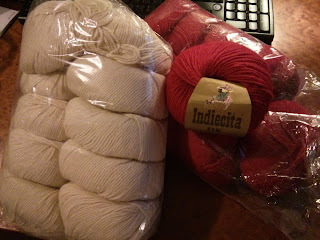 The other two are a silk/wool blend and are going to create a stripey yoke for a top-down raglan I have in mind. This peeped out of a sale bin at me and even though the yarn is pretty scratchy I just love the colours in it, so I thought I would put up with it and make a hat or something. 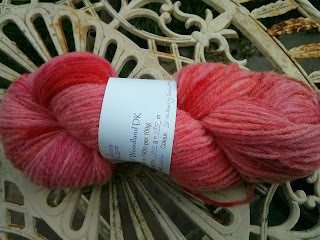 On my way out, the Knitting Swede reeled me in. 1400m of 4-ply in Burlesque. I just couldn't resist the colour. I also had a good look round the farm shop and stocked the freezer. This farm used to supply all the meat to my local butcher, who long-time readers might recall suffered a fiery fate (the shop, not the man) a few years ago. It was a relief to find a familiar-looking butcher counter. A great event, all things considered. I hope it comes back next year. 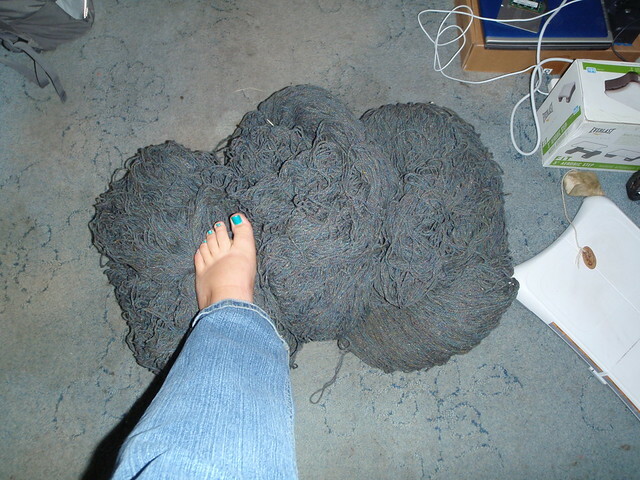 I have this big bundle of yarn in my stash. I'm pretty sure it's Rowan Yorkshire Tweed DK. I rummaged out of a box at Fibrefest in 2009. The chap on the stall seemed a bit meh about it and said it had been for the next day but he would sell it to me for £30. Emma and April bought similar bundles, but they paid theirs forward at some point afterwards. Me being me, this got listed in my stash, Mr Z took one pass at untangling it and then it was put away and not thought about. 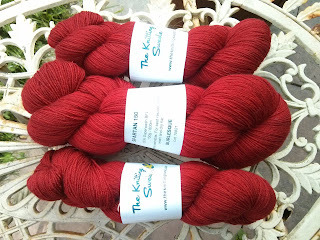 However, since Rowan discontinued the colourway and then the yarn (I think it was in that order), every so often somebody leaves a comment on my stash or contacts me, as they did last night. So, this morning I thought I would haul it out and have a looking at what I was actually dealing with. Firstly, my estimate of 1500g was extremely generous - the scale said 685g. Secondly....just, ugh. Not only are there dozens of ends, but the yarn is so lightly twisted it comes apart with only the smallest provocation. Mr Z and I whiled away some hours today (him considerably more than me, admittedly) trying to get it into something workable. The good thing about it is that it felts with relative ease so I have spit spliced in several of those smaller pieces now and I have three good-sized cakes out of my portion, which was less than half. And having done all the spit splicing and seeing what poor condition this yarn is in, I have absolutely no guilt about not selling it on to anybody who has shown an interest in it. It would definitely be a curse rather than a blessing. Will I knit something with it? Hopefully. It seems a rotten waste otherwise. Me: Who can give me an example of a year from the 1st century BC? Me: No, because remember that funny rule I taught you about centuries....? The Fossil is sort of finished. Mods: Substantial. I knitted this top down and in the round instead of bottom up and pieced. I added a bit to the neckline to give it more coverage. I am in the process of adding sleeve edgings. I think, on balance, I can cope with the neckline. When I look at it I wish it was garter stitch all the way to where the blue changes but, meh. I will stick this in the boat I call - when I'm wearing it I won't be able to see it so it doesn't matter - and let it sail away, as it were. I am, however, taking the advice of several people and adding some sleeve edging in the darker blue. 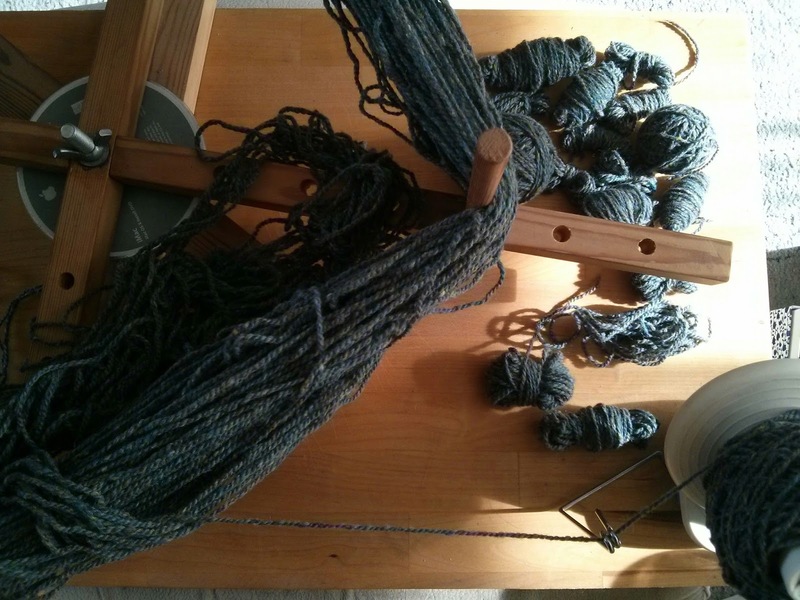 I picked up stitches and and working a 2x2 rib. 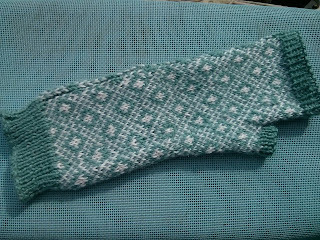 So, it's not actually a FO, yet, but I am too desperate to finish it to continue calling it a WIP. It is a lovely top, to be fair. The Damask is deceptively warm and has great drape. I like the curly bottom and it's a good opaque fabric (I am wearing a bright pink vest top under it in these pictures). Here I am rocking it in the summer chair I bought from B&Q...it has been raining basically since I bought it so I haven't had much chance to sit in it. New skirt, too. I love it. I am becoming a walking advert for Boden. Obvs I haven't done a lot of bikram in the last couple of months, as I think I mentioned in my last post. I am going to go again later, assuming either the shopping or Mr Z arrives before 4.30 this afternoon. There's no sense in putting it off and I have back pain which will be soothed and improved by the yoga. And also by the ensuing weight loss, I reckon. Holidays have not been good for the old waistline. I did make it to a yoga class on holiday, though. I went to the delightful Bikram Las Vegas studio which happens to be just a short drive from Father Hand's house (short, as long as you don't miss your turning). I went there the day after we flew in in an attempt to deal with my jet lag. The studio is really lovely - bright and airy, thanks to one wall being windows looking out into the car park (with that film on them to stop people seeing in, natch). Tonnes of mirrors. The most amazing, enormous showers with shampoo AND conditioner. Friendly, helpful staff who let me take the class and pay afterwards because I was late, thanks to all the driving around. A lovely selection of yoga wear. A very friendly instructor who I think was a bit nervous in a silent room of only 6 students, because he kept trying to make us laugh. The class did not go well, though. I mean, I knew it wouldn't what with all the flying and everything, but it was a really bad one. I sat out a lot of second postures. It is probably the closest I have ever been to throwing up in a class. I don't think it helped that the instructor periodically turned on the fans and even the air conditioning, which cooled the room down considerably - it was shortly after each of these cool bursts that the nausea overtook me. I was quite surprised because he told me at the start that the studio had a reputation for being particularly hot. Well, Bristol apparently has that reputation too (according to one of their travelling instructors) and I know which one is hotter. I also found it a bit odd that, when we did what I refer to as the sideways poses (including triangle), instead of having us turn on our mats to face the mirrors at the end, or having us turn our mats around (there was plenty of room), we just did the poses facing the front, feet either side of the mat. Fine, ok, but the floor was carpeted and my feet had no grip. Not pleasant. No rug burns or anything, just no grip. I decided that the next day I would risk the wrath and turn my mat. I made it back to the 7.30am class the next morning (thank you, jet lag) but, disappointingly, no instructor turned up so the dozen or so of us that crawled out of bed for the pleasure were left kicking our heels in the car park. Sadface. I emailed to query it but received no response. This kind of let them down a bit; I was sorry not to practise in that great space for a second time. Nevermind: there will definitely be a next time. I was reminded of this picture because I went back to bikram tonight after nearly 6 weeks off. Mr Z took this when we were on holiday at Lake Tahoe last month (so I'm not throwing back very far). Every time I was in water this summer I took the opportunity to work on this pose, since the water did some balancing for me and allowed me to easily grab my ankle from the inside. At this point I was balancing on a rock to keep my chin above water. It was extremely cold but I persevered for quite some time: the activity made me warmer. You'd think, with all the practising, that I would have got on alright this evening, but you would not be correct. At least I went back.